Howard is one of Tucson’s most successful and most-accomplished high school football coaches, coaching from 1963 at Sunnyside High School as an assistant coach to 2007 as an assistant at Sabino High School. In between, he was the head coach at Sahuaro High School from 1979 to 1994, highlighted by his selection as Arizona 4A Coach of the Year and a state co-championship in 1994. His Sahuaro teams were state runner-ups three times, and he was also selected Coach of the Year for other times in football and wrestling. His wrestling team at Sahuaro won the 5A state championship in 1972. Howard also coached football and wrestling as a head coach and assistant coach at Rincon High School and Tucson High School. Howard graduated from the University of Arizona in 1963 with a Bachelor’s degree in Education and played on the UA football team for three years. He was a team captain in 1962 and earned a Most Inspirational Player Award. As a wrestler, he was the UA heavyweight intramural champion. 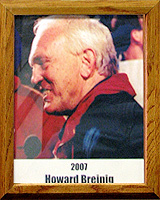 Howard served as president of the Arizona Coaches Association for two years, vice president for three years and was selected to the ACA Hall of Fame in 1996.